Seats 4 People: Extra Leg Room, Black Exterior and Interior leather seat, Rear armrest with Radio and A/C controls. Seats 3 People: Grey Metallic Exterior & Black Interior, Rear-seat center armrest AC and Radio controls, Premium Audio. Our Sedan Car service Vancouver Airport Fleet is a simple and luxurious way to travel. We offer much better corporate black car service compare to Vancouver Taxi Service. 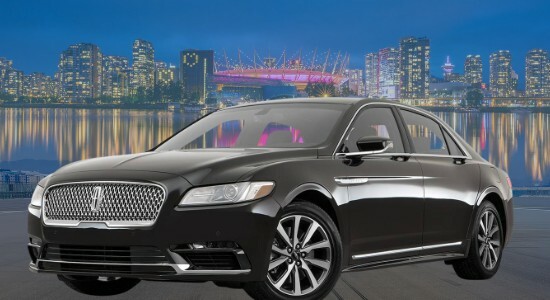 Vancouver Airport Car Service offer late model, luxury sedan "Mercedes-Benz E Class Sedan Car service Vancouver Airport, Lincoln Continental, and Lincoln Town Car Service" to picks you up for a private ride at your preferred time. 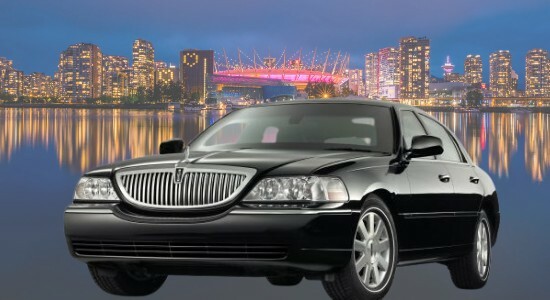 Town car service Vancouver Airport can drop you off at the airport or other destination in style. All our Vancouver airport pickups include meet and greet for little extra cost. This way you don’t need to worry about how to find your driver. Our driver will be waiting at arrival area with your name tag in hand. Vancouver Airport Car Service is a best way to travel in style. Our Sedan Car Limo Vancouver Airport offer pick up and drop to concerts or sport events. You can hire sedan cars for corporate events. We can take you to and from business meetings, airport or dinner. 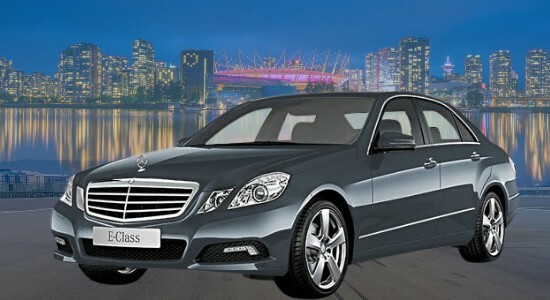 We offer on demand Vancouver sedan car service or you can also pre book. We offer Vancouver sedan car Service Surrey, Langley, Richmond, Coquitlam, Burnaby and Maple Ridge. Please call us at 604-597-9040 or use our advance car booking system. A wedding is not complete without a Wedding Limousine service Vancouver to provide transportation for the Bride & Groom. Wedding limos play major part in the wedding planning and should not be left to chance. Make your Airport Limo Vancouver BC booking in advance. We send you an email to confirm your booking, so no need to worry about, getting late for your flight. Also, Advance booking can be made for any time during day or night. Choose wineries from the list on our website and let us know which Fraser Valley wineries you like to visit. Then we can setup Vancouver SUV Limo Service wine tasting tour of these wineries on your behalf or call them directly. Need transportation for corporate clients? We can help with a newer model luxury ride that can uplift your image; it will be more than just a transfer; your client or partners will notice, we charge comparable rates to taxi cabs. Graduation is certainly most exciting events in your life. Grad officially marks the end of your hard work to get that high school or college diploma. During event, there is no better way to reward yourself with luxury ride. Explore the culture, nature, and wildlife of BC, sightseeing city tour start from Canada place, Aquarium Stanley park, Grouse Mountain, Suspension Bridge, UBC. We have packages to visit great places, attractions & activities. Is it your birthday? Is someone you love celebrating it? Does't really matter; what does is how you can make it special, instead of gadgets, movies & food that are so routine, consider a birthday limo, yes you read it right. Instead of getting stressed from waiting for a taxi or walking a mile to the concert, let us treat you like a celebrity. We can pick up from your home and drop you off at the right front of the door in luxury, safe, and comfort ride. Destiny Limousine is committed to giving each customer with great value for money. For this reason, the company has introduced Vancouver airport Sedan Car service for both Metro Vancouver and Fraser Valley. These packages are tailored to fit individual needs and preference. Clients are also given an option to choose between hourly rate or Vancouver Airport Pickup Service flat fee that compliments their budget. Aside from Airport Sedan Car Service Vancouver to Whistler, Destiny also specializes in providing corporate black car service late model luxury sedan, luxurious, safe, professional, and reliable transportation service for graduations, weddings, wine tours, city tours, and business travels. ✅ We provide transfer trips from or to the Airport. ✅ Sedan Car Hire Vancouver from/to cruise ships. ✅ Our drivers are fully trained & well dressed. ✅ We are open come and see the fleet before booking. ✅ We sign contract with price and type of vehicle you are getting. ✅ Business meeting or corporate events. ✅ All Day Vancouver Sedan car hire discount up to 12%. ✅ We offer city tour for group of 2 to 20-30 people. ✅ Calculate Cheap Limo Prices or Vancouver Black Car Service Rates. ✅ Book a Vancouver Airport Sedan Car Service from your phone or Tablet & make changes. Airport Black Car Service and Airport Limo Vancouver to Whistler and Shuttle back to YVR, South Terminal or BC Ferries. Airport Shuttle all the way Port Moody, Chilliwack, Abbotsford, Delta, Pitt Meadow, Langley, Mission. Rent Airport Car Service Vancouver BC, Coquitlam, Surrey, White Rock, New West, Richmond, Burnaby, all over Fraser Valley. Reliable YVR Vancouver Airport Car transfer just for yourself or transport corporate group for Christmas, Award function, family dinner, night out having fun or birthday celebration. We are a good option for ridesharing, luxury ride, shuttle people from one place to another. Vancouver Airport Car Service are a better option for the group when you compare Vancouver Sedan Car Service Prices with Vancouver taxi rates.